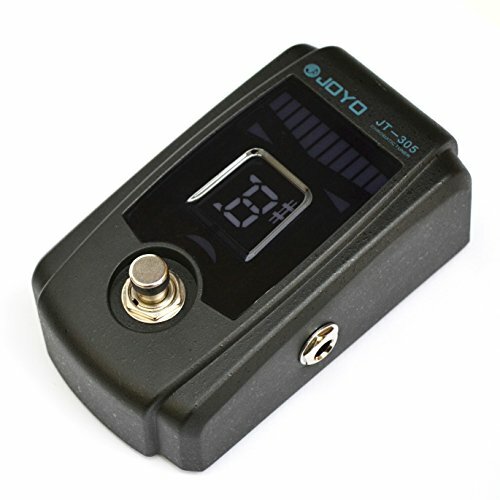 Joyo JT-305 Guitar Pedal Tuner with Metal Casing 4 Display Modes + 4A Frequency + True Bypass Description: The JT-305 is specially designed for Stage. This has No Sound Loss by True-Bypass, and when tuning guitar is muted. Guitarist can read the display very easily with Large LED display. The note flows Left and Right, so it is very easy to recognize tuning. There is no battery loss when in bypass mode. Feature: - 100% True Bypass output keeps your tone intact. - Choose from four types of display modes: Meter, Strobe 1, Strobe 2, Strobe 3. - Compact pedal sized guitar pedal tuner that fits in your pedal board. - Large, bright LED meters clearly show any tuning discrepancy. - A broad detection range from 0A(27.5Hz) to C8 (4186 Hz). - Calibration is adjustable from 436 -- 445 Hz. - A 9 VDC output jack is provided for cascading the power supply to other pedals. - Sleek, black and tough aluminum die cast body for superb durability. Specification: - Tuning range:0A(27.5Hz)-8C(4186.01Hz) - A4 Frequency:436HZ-445Hz(1Hz/steps) - Detection accuracy:+/-1 cent - Power supply:one 9 v type battery or AC adapter(9 V,600 mA or greater) - Input impedance:1 M-ohm(tuner on) - Current consumption:maximun 55 mA - Battery life:approximately 5 hours continuous use with tuner on (A4 input continuously,Meter mode) - Dimensions:76(W)*120(L)*46(H)mm Notice:Battery is Included Package Included: 1 x STAGE TUNER 1 x User manual 1 x Battery. If there is a size or colour choice please email me with your choice or it will be sent at random.